Deliver your Dyson to us for service or repair to our factory for a fast and efficient service. ready to collect within 48 hours. Simply send your Dyson to - Dysonic, 69 Badby Road West, Daventry, Northants. NN11 4HJ. *Service is for working cleaners that require attention to bring back to expected performance. 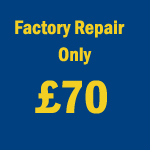 If major parts are required we will contact you before carrying out repair.